Three vertical stiffeners (you can only see two of them in the picture below) on the sides of the cutout support the top of the seat so that the latch can be opened even when you are sitting on the seat. Note that the frame has to be assembled inside the seat area which somewhat dictates its design. The plastic bin on the left is held in place by the lip of the wood frame. The bin on the right has been lifted over the lip and pulled out for access to the contents. Below: The back side of the frame is only glued (epoxy and glass) to the boat hull. I still have access to the bilge area under the frame. The cabinet door is an epoxy laminate of thin plywood and oak. Two six volt golf cart batteries are under the Vberth bed as far forward as they will go. This is on top of the ballast tank so no screws can be used. A piece of wood first had anchors installed (like eye straps with backing plates), then the piece of wood was epoxied to the top of the ballast tank. Additional epoxy/ glass was added over the wood piece to secure it. The battery boxes are both screwed into the top piece of wood along with the anchors. Expansive foam around the two battery box's has kept them secured for nearly 10 years no. Below: An access cover above the batteries was cut in the Vberth fiberglass to allow the batteries to both be removed and also watered. Aluminum angle provides a base for screwing the access cover in place. Below: The new storage area is just aft of the batteries. A lexan plastic divider separates the battery and the storage area and the storage area has a thin plywood floor with ribs for stiffening. Below: The battery box's initially had plastic snap buckles but these had failed. The nylon straps were still good. 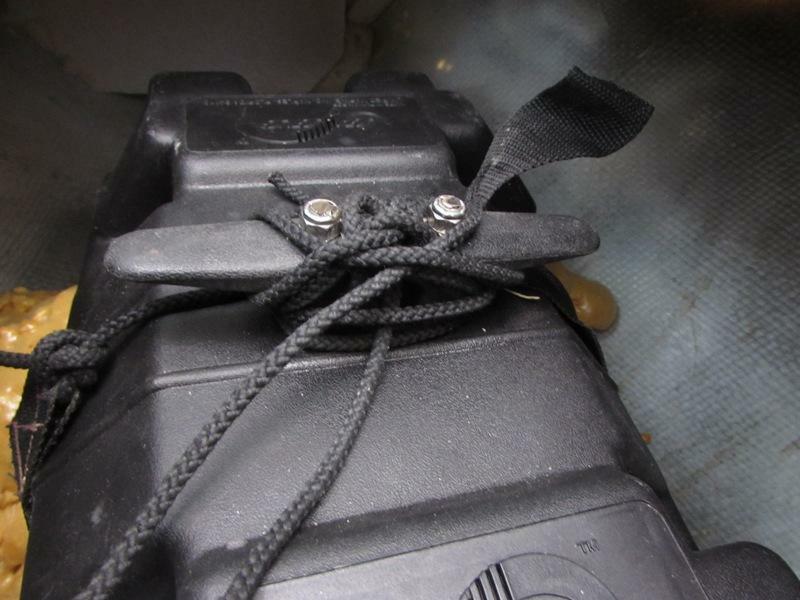 A horn cleat was added to the top of the battery box so that it can be robustly secured. The straps go to the anchors on the wood piece that is glued to the top of the ballast tank. 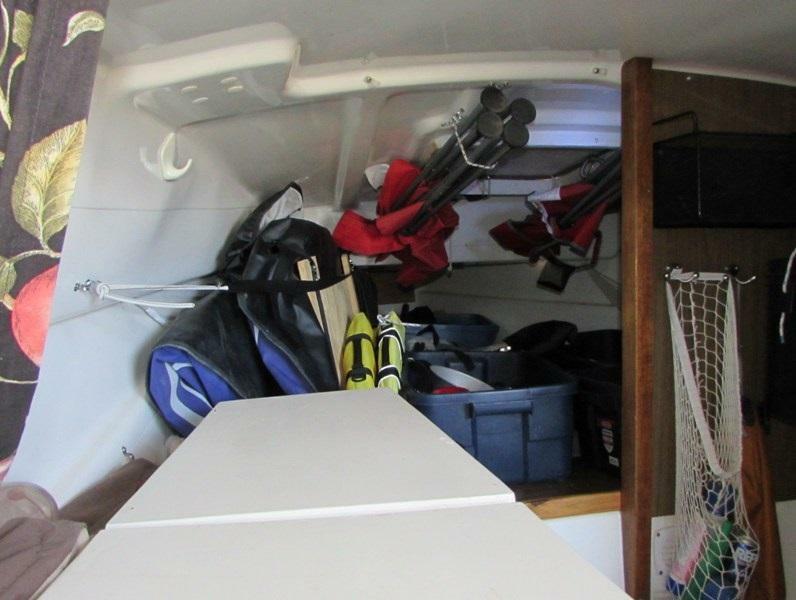 Below - this is what the Vberth normally looks like and is a storage area. A bunch of bins, inflatable kayak, folding chairs etc. The new large folding access hatch will make it way easier to use the below storage area. We used to have to move this stuff out of the way to access it from the top. This is a quick place to store items such a wallet, keys, cell phone. Easy to use but since the box slopes downward, stuff in the box stays put. Below: Wallet storage box just to the right of the paper towel roll. I also needed access to the inside of the area behind the wallet box so its removable with two screws.